Right: Comparison of Thick (top) and Thin (bottom) Necklaces. 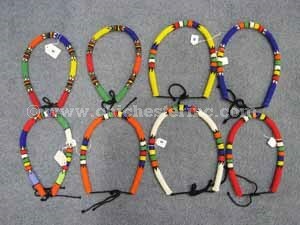 These are real Zulu beaded necklaces from South Africa. These are made with glass beads. The thin necklaces are shown above. The thicker ones are about twice as wide. For a comparison picture of the two, click HERE. 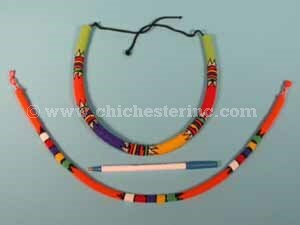 The thin necklaces are approximately 22" long overall (including the tie) and about 0.25" in diameter. The thick necklaces are approximately 19" long with a 14" tie. They are about 0.5" in diameter.